No fewer than five persons died on Thursday, while many others were injured during President Muhammadu Buhari’s campaign in Taraba State. Two of the injured persons are said to be in critical state. The convoy of the State Governor Ishaku was also attacked on its way out of the Danbaba Suntai Airport, according to The Nation. 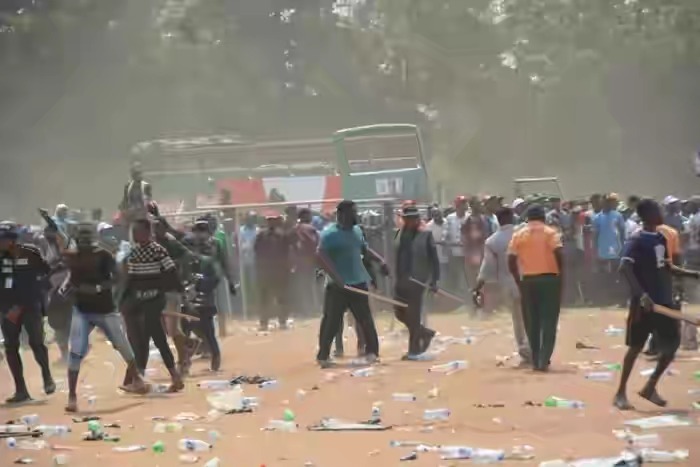 This occurred when the governor and his deputy Haruna Manu and other officials of the government went to see off President Buhari after the rally. 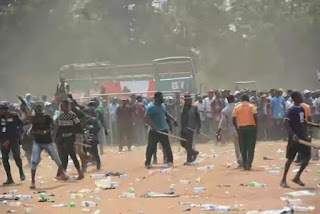 All of the governor’s posters and billboards and those of Atiku Abubakar in the State capital, Jalingo, were mutilated. He also accused security agents of negligence of duty. “The deputy governor’s car and several other cars in the convoy, including that of the commissioner of police and a special Adviser to the governor, were damaged. “The thugs, most of whom were imported from neighbouring states to create the false impression that APC enjoys a large following in the state, came heavily armed. “They carried guns, cutlasses and sticks, which they displayed openly and in the full glare of security agents who merely looked the other way,” Abu said. He also accused those he described as “APC thugs” of going round Jalingo metropolis and destroying PDP posters and billboards. “They were given cover by the security agencies who fired gunshots to scare away those who may dare to confront them. “What happened today is a big contrast to the PDP presidential flag-off of February 5 in Jalingo, which attracted a large crowd but recorded no incidence of crisis and deaths. “Residents of Wukari are still leaking the wounds of the APC violent visitation of January 29, during which PDP posters and bill boards were torn and a member of the PDP killed. “The Taraba State government will no longer fold its arms while innocent people are being killed and maimed,” Abu said.